M191 | 964 m. | 3163 ft.
1995 Nachdem Cord wegen Knieproblemen ausfiel – ich laborierte zwar noch an der Bänderdehnung, die ich mir wegen lustiger Videoaufnahmen (Rinderwahnsinn) zugezogen hatte – wollten Alex und ich mal einen Berg auf Skye besteigen. Vom Sliagachen Hotel aus sprinteten wir zum Fuss der Cuillins. Das Tempo drosselten wir erst wieder als vor uns eine 20köpfige Gruppe an einer engen Aufstiegsstelle nicht vorwärts kam. Es gab einige nette Scrambles und kurz vorm Gipfel noch einen Traudichschritt bzw. Bad Step. Auf dem Gipfel selbst herrschte drangvolle Enge (es war ein Sonntag). Es gab nur einen Weg zurück – den, den wir gekommen war. Abschließend nahmen wir noch ein Bier im Sliagachen Hotel zu uns. (RachefürSchumi-Tour mit Jacke vergessen Memorial und abholen am nächsten Tag). 2000 Staying at the Sligachan Hotel for four days with Stephanie and Fiona I had set my eyes on the three Munros lying south to south-west of our lodgings. On a fine sunny early Saturday afternoon at 1pm I set out from the Hotel walking up the easy path to the waterfalls of the Allt Dearg Beag where a small footbridge crosses the burn. In contrast to what the maps show the path up into Corrie Riabhach is quite well worn and obvious. In the upper part of the corrie, however, I had some minor problems finding the easiest route up to the south east ridge of Sgurr nan Gillean and a little enjoyable scrambling followed. Once on the ridge I paused to take in the panorama of the Cuillin ridge stretching out before me to the south-west. I met a few other hikers on the south-east ridge who were already on their way down the hill and found my way up to the summit of the Sgurr by first following the crest of the ridge and then walking over some bands of rock on the left-hand side of the crest. The tiny summit plateau was all mine. What a privilege – nobody there. I paused for half an hour and enjoyed the scenery from this marvellous viewpoint. The way back on the upper part of the crest of the south-east ridge was more exciting and difficult than the way up had been. I made it safely – nobody else on the hill anymore – to the foot of Corrie Riabhach and to the Allt Dearg Beag where the cold water of the burn was a shock to my senses – I had run out of water on my way back. My bones signalled to me that I should perhaps have opted for a lesser hill than Sgurr nan Gillean to start hillwalking again after one year’s pause. But the sunshine carressed the heather slopes with warm autumn light in so lovely a way that I forgot such thoughts and strolled back to the Hotel, to a warm shower, a good meal and a few pints to celebrate my first Munro in the Cuillins with Stephanie. Description Sgurr nan Gillean is the northernmost peak of the Cuillin, and is prominently seen from Sligachan Hotel. The view of the peak from there shows the south-east ridge, up which goes the 'Tourist Route', on its left and the west ridge on its right. The finest feature of Sgurr nan Gillean, however, is its north ridge, the Pinnacle Ridge. 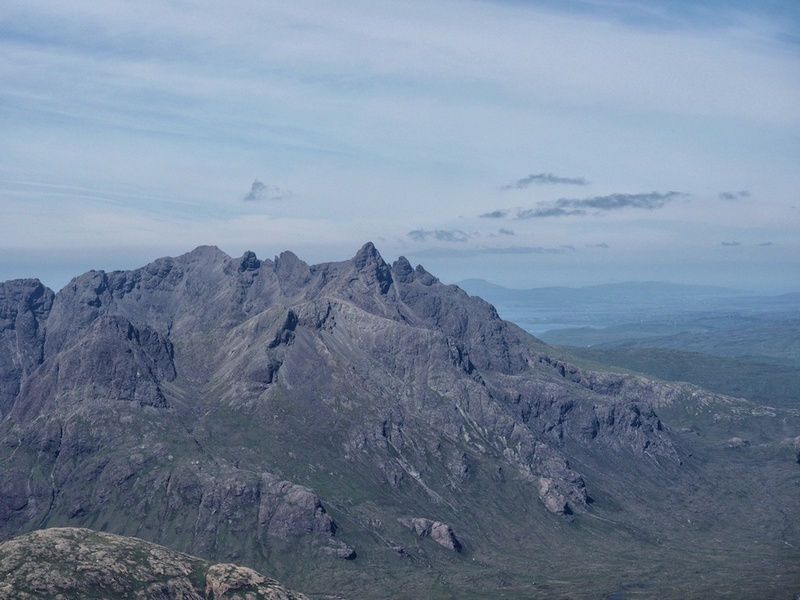 The view from Sligachan does not reveal its true character, with four pinnacles and a sharply serrated outline, but it is one of the most spectacular ridges of any of the Cuillin peaks. The south face of Sgurr nan Gillean overlooks Lota Corrie and is a wild place, seldom climbed.The Tourist Route, by which Sgurr nan Gillean was first climbed in 1836, starts at Sligachan and goes south by a well-defined path across the moor, crossing the Allt Dearg Mor and the Allt Dearg Beag and heading towards Coire Riabhach on the east side of the Pinnacle Ridge. Follow the path, which becomes less distinct as it climbs up into the boulder-strewn head of the corrie, and reach the south-east ridge of Sgurr nan Gillean. The last part of the ascent up this ridge involves some scrambling, none of it very difficult, to the sharp-pointed summit.